In the Georgian town of Batumi, on the picturesque coast of the Black Sea, is the most famous dolphinarium in the country and the first on the territory of the entire Soviet Union. Since 1975, tourists from all over Georgia and other countries come here, so you have to buy tickets for the show in advance. Performances are held in a modern water-entertainment complex in the open air. The pool is decorated with picturesque scenery, creating an atmosphere of wildlife. The auditorium looks like an amphitheater, protected from the sun and weather by an elegant glass dome. 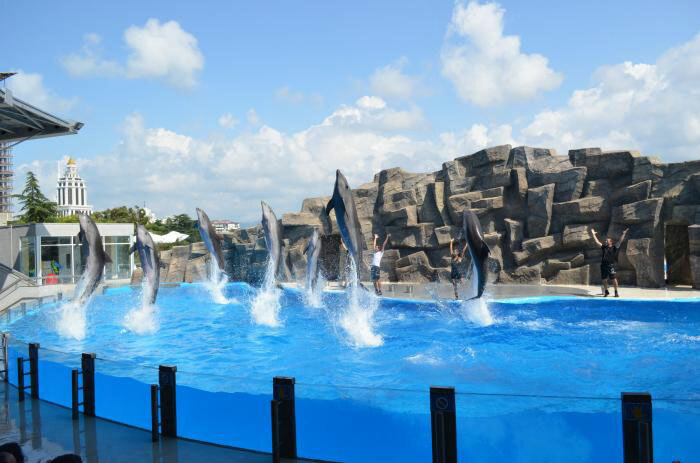 In the vicinity of the dolphinarium there is a large aquarium, a zoo and a lake.